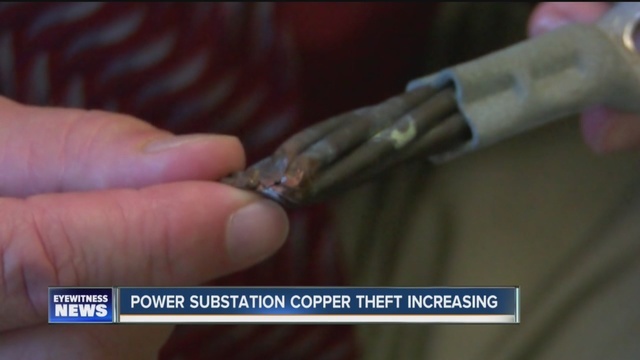 SPRINGVILLE, N.Y. (WKBW) – The number of copper theft incidents at electrical power substations is continuing to rise in both Erie and Wyoming counties – especially in the last few months. said Steve Brady, spokesperson for National Grid. Besides being extremely dangerous for the thief, stealing copper grounding wires creates a hazardous situation for power crews that go in to make repairs. “Those grounding wires are there for a reason,” added Brady. Strangely, the number of thefts has increased over the last few months even though the price of copper is down. Some speculate the crooks may be stockpiling the copper until prices go back up, while others think the copper is being sold for quick cash at metal recyclers in order to buy drugs. The most recent incident happened this past Sunday when a thief broke into Springville’s substation and stole approximately $100 of copper grounding wire. The crime knocked out power to 4,700 customers in the village for 4 hours. “Some people get their water pumped in by electricity, so they didn’t have water,” explained Debbie Carney, a waitress at Springville’s Cozy Corner Restaurant. The power outage forced the restaurant to close early. NYSEG and National Grid tell 7 Eyewitness News they are stepping up security at substations with the addition of video surveillance cameras and increased patrols. The utility companies ask the public to call police if they spot suspicious people at substations. Tip-offs include people without any safety equipment, or driving vehicles without electric company logos on them. Metal recycling companies are also being asked to keep an eye out for suspicious customers. “We would hope the scrap dealers would step up too and know their customers. Maybe ask a few questions when somebody they have never seen before shows up with the kind of copper you wouldn’t expect a scraper to have,” said Steve Brady.